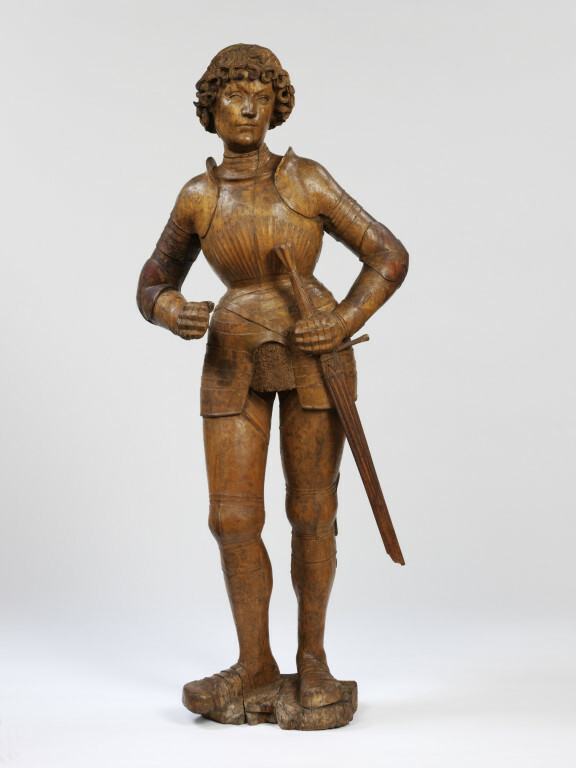 This wooden statue was probably carved for an altarpiece. These are the ornamented, image-bearing blocks or panels that stand behind the altar in a Christian church. The style and facial type of this warrior-saint offer clues to its origin. They are closely related to the sandstone monument of Johann of Bibra in the church of Bad Bibra in the Halle area of Saxony. The monument was designed by the German sculptor Tilman Riemenschneider (died 1531). However, the somewhat stiff carving of this figure suggests that it was executed by Riemenschneider’s workshop rather than the sculptor himself. 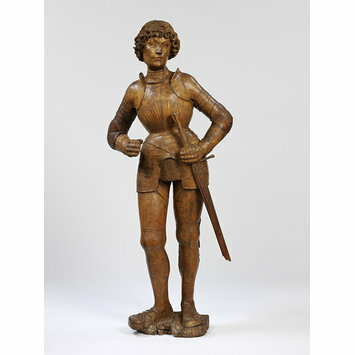 Male warrior saint, possibly St Maurice.The saint with short curly hair stands frontally on an irregularly shaped base looking to his left. In his right hand he originally held a lance (Goldschmidt 1917, pl. 46 shows a tournament lance) while his left rests on the hilt of the sword. Beneath the quillon appears the letter "M" indicating perhaps that this is a representation of St Maurice. He wears a mail shirt under the gorget with three lames around his neck and a fluted breastplate of globose form. Tassets are attached to the waistplate which consist of five lames. His shoulders, arms and hands are protected by pouldrons with a haute pièce, vambraces and gauntlets. His legs are covered by cuisses, poleyns, grieves and square-toed sabatons. The Saint was probably originally painted as a black saint (for the saint as a Moor and comparable figures see Suckale-Redlefsen 1987, pp. 83-112).The figure consists of two pieces of wood joined laterally. The back is flat. Several wedges are inserted into the base, which consists of two segments joined together. The polychromy has been completely removed with the exception of traces of gesso on the forehead and traces of red colour on the lips. The figure has suffered heavily from woodworm with the result that the right hand broke off and was repaired. Several damaged areas on the back have been filled. The left side of the lips of the mouth through which the crack runs through is distorted from later re-carving. The bridge of the nose, two locks of the hair on the forehead, and one on the right temple, the right quillon and the scabbard are all later replacements. The left quillon and the lance are missing. Bought from Steinmeyer & Söhne, Cologne, for £153 2s. 6d together with A.59-1920 (cat. no. 77) in 1920. Previously in the collection of Richard von Kaufmann, Berlin, (Goldschmidt 1917, no. 327, pl. 46). Historical significance: The figure was classified by Goldschmidt (1917, p. 41) as Swabian, and dated to the beginning of the sixteenth century. On acquisition the statue, which probably formed part of the corpus of an altarpiece, was described as South German (Departmental records). Its style and facial type of A. 58-1920 however are closely related to the sandstone monument of Johann of Bibra in the church of Bibra. Justus Bier dates the latter to about 1508, and suggests an origin in Riemenschneider's workshop, executed by a stone carver (Bier 1973, p. 93, pl.176). It seems highly likely that the present figure is also based on a design by Riemenschneider; although the somewhat stiff carving is not of a sufficiently high standard to warrant an attribution to Riemenschneider himself. Goldschmidt, Fritz. Die Sammlung Richard Von Kaufmann, 3. Die Bildwerke. Berlin, 1917, no. 327, pl. 46. Jopek, Nobert. German Sculpture 1430-1540: A Catalogue of the Collection in the Victoria and Albert Museum. London: V&A Publications, 2002. cat. no. 20. pp. 63-64.